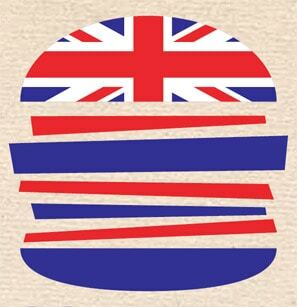 Shake off that rain, fire up the coals and grills as Britain prepares for British Burger Week 2012. This national event is set aside to pay homage to ‘the burger’. Traditionally ‘the burger’ began its life as shredded steak meat, however the terminology has since evolved to encompass a wide range of ingredients mixed together, served in a sliced bread roll often accompanied with salads and sauces or relishes. The invention of the burger is disputed but the common current consensus it that the burger appeared on menus in the late 1800’s in the U.S. It’s agreed that the name ‘burger’ is an abbreviation of Hamburg, so whatever your view on ‘who’ created the burger, one fact remains standard through all historical-yarns, immigrants from Hamburg Germany who settled in the U.S. brought with them some of their favourite foods, one of these being the method of shredding and seasoning steak meat (often cheap off-cuts) and serving it as an enjoyable light meal. Curiously during the first world war, anti-German sentiment saw the hamburger briefly renamed to the “Salisbury Steak”, the name “hamburger” made it’s come back post-war to en-grain itself into today’s menu culture. Since the boom in fast food establishments towards the end of the 1970’s the hamburger has become a staple item on many menus, from simple burger-van style burgers containing basic ingredients that you can buy for £1 or less, to gourmet style burgers fetching up to and over £3000 (made from Kobe beef from Japan). These days burgers also use different meats, vegetables, buns, accompaniments and relishes to tantalise you into choosing them from the menu and specials boards. Kids love burgers, they are like a cheeky treat, students love to throw them half eaten on the streets after a night out, adults look to the burger as usually being the cheapest, easiest, tasty meal on the menu. Men use their burger flipping skills at barbecues to assert dominance, and women have added flair and diversity to create some of the worlds best burgers. Yes, the burger is here to stay, part of our culture, part of our menus, say what you will about this being just another way to make money, burgers taste great. Food giants Heinz and 3663 wholesales distributors have teamed up to find the nations favourite burger recipes. Straight from the 3663 kitchen you might want to try some of these bad-boys that they recommend (click here for the burger recipies). BITE is interested to find out just what is your favourite burger? Have you got your own secret recipe, or method for preparing your burger-masterpiece? If you’d like to share it with other BITE readers you can do so by adding it to our comments section below or by joining the conversation on our Facebook page. Hold your burgers high, cheers!